One of four internet users in the European Union experienced security problems in 2015, a new Eurostat study released for Safer Internet Day (February 9) reported. At 43%, Croatia reported the highest percentage of users who experienced such issues, followed by Hungary (39%), Portugal (36%), Malta (34%) and France (33%). 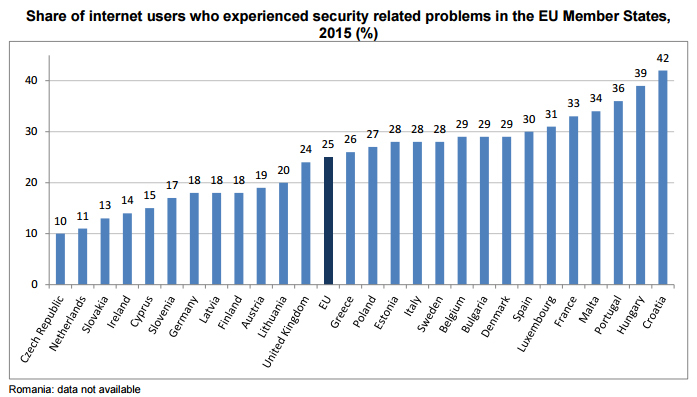 But only 1 in 10 internet users in the Czech Republic reported security problems in 2015 – the lowest percentage across the EU. After the Czech Republic, the Netherlands (11%), Slovakia (13%), Ireland (14%), and Cyprus (15%) also reported a low percentage of internet users who experienced security issues last year. Only 8% of Czech net users caught a virus in 2015, down from 26% in 2010. Across the EU, however, internet security remains a major issue, with many users expressing concern over making purchases online or connecting to public WiFi. See the Eurostat press release for further details. Is the net really safer in the Czech Republic? Or are Czech internet users just that much more savvy? Given that Prague is the headquarters of internet security giant Avast Software, who holds the biggest market share of antivirus software in the world, perhaps the news shouldn’t come as a surprise.